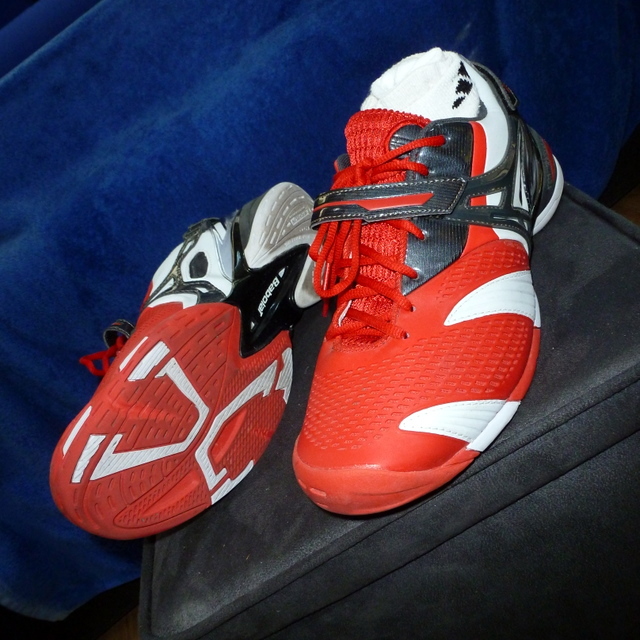 Two weeks ago I bought a new pair of tennis shoes to replace my couple of pairs of NIKE Max Air tennis shoes. The Max Airs were ruining my toes and just didn’t feel good. 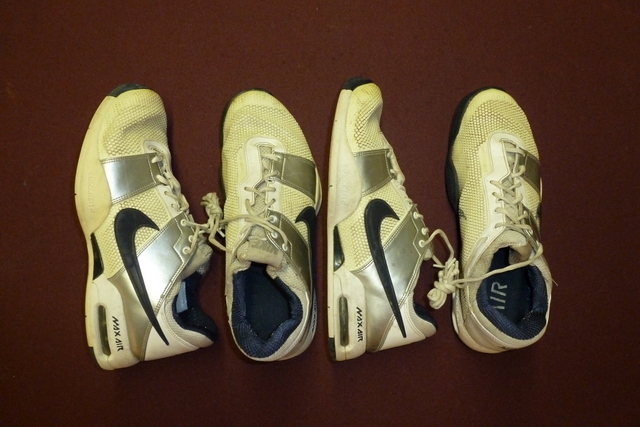 Found a really comfortable pair of new sneaks at our tennis club in Concord NC (SportsCenter) and made a good deal on a racquet and the shoes. The only color he had was red. I’ve never had red tennis shoes but now I do. We are enroute from NC to Iowa and stopped overnight in Dayton OH to visit friends, eat pizza at Marion’s, rest up, and go again. While in Dayton we knew we could find local parks with tennis courts — Ohio is great at state parks and they are great with city and county parks. Our friends gave us helpful directions and we found nearby courts in very good condition. Debbie and I hit some tennis this morning at Walther Park in Kettering, a ‘burb of Dayton OH. I wore the only pair of tennis shoes I now own. You know, full-timers don’t keep a lot of extra stuff so the NIKES (with great tread and uppers still) are now for sale at the local Value Village. After tennis we found the local SuperCuts and trimmed our haircuts. The truck’s gas tank was down to the last 1/2 inch of gasoline (seven gallons spread out on 7′ X 1’ bottom surface area) so we were pumping fuel into it. I look around, see no one. Not many people are pumping gas in red sneakers, right? I realize it has to be the attendant inside the convenience mart and he’s talking to me. So I say, “Thanks”. At this point I really should have gone inside, let him see these sneaks close up. The sneakers are great looking from sixty feet. Think how good they look from six feet. Really great! But I was just beginning pumping almost forty gallons gas into our tank and another car had pulled in almost under our bumper. Need to stay with my truck a few minutes. I holler back to the gas pump microphone, “These are Babolat tennis shoes, like Roddick wore!” And if I had gone inside I could have talked with the guy a few minutes, found out if he likes tennis shoes or just red shoes. 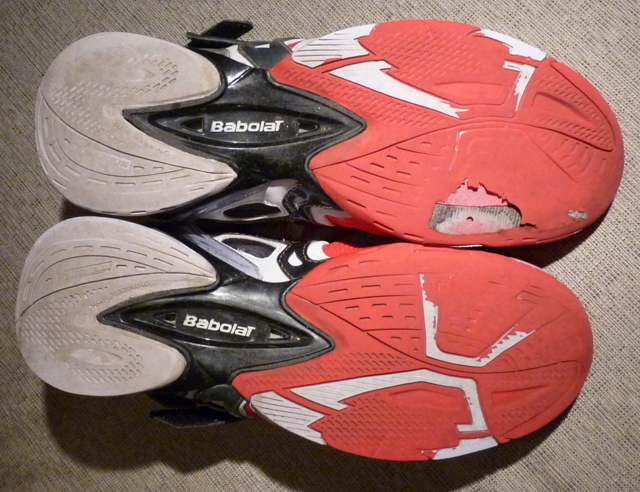 I could have told him these are Babolat Propulse 3s, have Michelin tread with a six month wear guarantee. And how much better these are for my feet than my Nike LunaPros even though I have narrow feet. I love these red shoes! I wish I had gone inside, if only to thank him for the compliment on my really cool tennis shoes. The Babolat brand and Andy Roddick name might not have registered with the guy, or he might be a sneakers aficionado. Who knows, there may be a spike in Babolat shoe sales in Dayton OH. Do you think they might buy the white ones instead? No one ever comments on white sneakers, right?